30 Restyling & tRuck AccessoRies | April 2015 restylingmag.com A year after Toys For Trucks president T.J. Larson took over the company from his father in 2008, he ran into former Toys For Trucks employee Billy Ciuplinski while the two were boating. "I could really use a guy like you to help grow this company," Larson says, but Ciuplinski wasn't ready to leave the trim shop where he did convertible tops, airplane interiors and Ferrari upholstery. A year later, the two met while boating again and Ciuplinski was finally ready to jump ship. 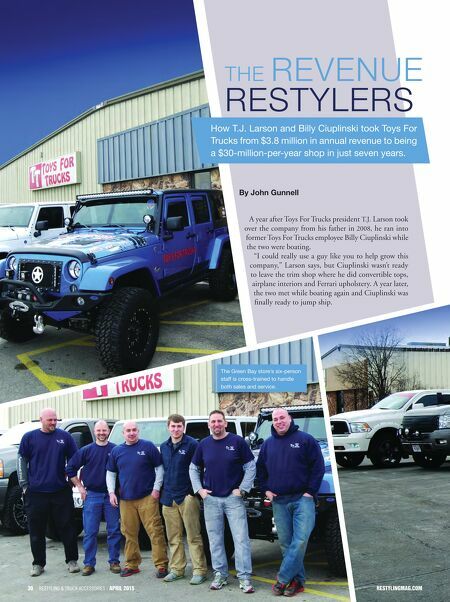 By John Gunnell The Revenue ResTyleRs How T.J. Larson and Billy Ciuplinski took Toys For Trucks from $3.8 million in annual revenue to being a $30-million-per-year shop in just seven years. 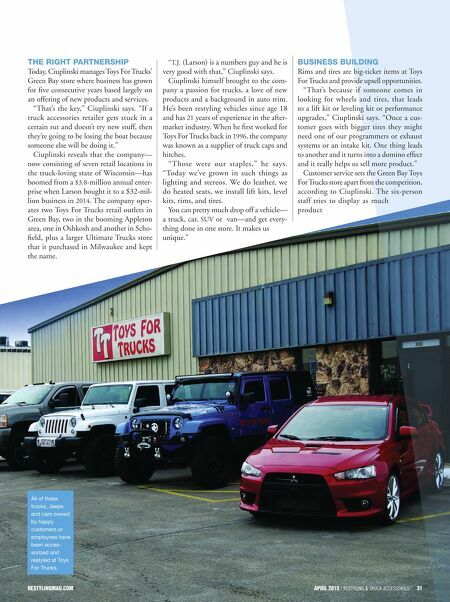 30 Restyling & tRuck AccessoRies | April 2015 restylingmAg.com The Green Bay store's six-person staff is cross-trained to handle both sales and service.